The Rabodirect PRO12 teams currently pocket 52% of the income from European tournaments, with Premiership Rugby and their French counterparts receiving 24%. The English and French clubs want that split to be 33% each but Premiership Rugby's plan, backed by BT, would also leave the Rabodirect clubs better off. However, the Celtic nations will not accept plans from the English and French clubs to reduce the number of teams in the Heineken Cup and force all PRO12 teams to qualify on merit. A further meeting is now scheduled between the key stakeholders for October 8 in Rome. 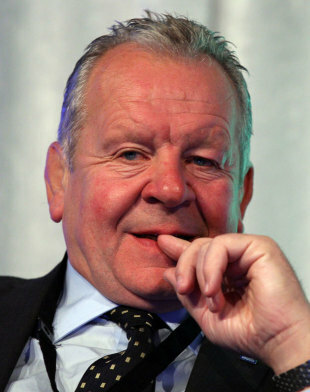 Rugby Football Union chairman Bill Beaumont is not expecting a swift resolution to the row over the future of the European club game but is determined to do all he can to ensure an amicable agreement is reached. Beaumont famously acted as mediator when England were expelled from the Five Nations in 1999 following a row with their Celtic neighbours over the distribution of TV money. On that occasion the former England and British & Irish Lions captain took the then Six Nations chairman Allan Hosie to the Drum and Monkey pub in Glasgow to iron out their differences. A similar approach may be required once again after initial talks between key stakeholders in Dublin this week, that followed some very public exchanges in the wake of Premiership Rugby's bid to re-structure the European landscape, ended in a stalemate. "I've seen these things come and go in the past and I would sincerely hope that over the next few months people will sit down and discuss it in a convivial atmosphere," said Beaumont. "Let's play it out around a room rather than in the media. "I think it would have been better if it had been played out behind closed doors rather than in the public eye," he added. "That is my only regret about it. But you know, we are where we are, what has been said has been said and now we've got to try and reach an amicable settlement that suits all parties." The timing and detail of Premiership Rugby's 'ground-breaking' broadcast deal with BT, that included exclusive rights to European games from the 2014-15 season by which point the current agreement governing both the Heineken Cup and Amlin Challenge Cup competitions will have expired, came as a surprise to Beaumont with a scheduled meeting between the RFU and the clubs on Wednesday set to provide some much-needed clarification. "We have been aware of the clubs' concerns and certainly Europe have been aware of the clubs' concerns regarding the structure of the competition," said Beaumont. "But I certainly wasn't aware of the announcement of the deal that the clubs brokered last Thursday morning. It will be interesting to see what the details are." Former RFU chairman Martyn Thomas turned up the heat on Premiership Rugby earlier this week by claiming their deal with BT was in breach of the long-term agreement that governs the elite game in England while both French rugby officials and their Italian counterparts have also queried the motives of the Premiership clubs but Beaumont is more interested in peace in our time than another legal wrangle. "I'm not a lawyer but I am advised that there could well have been a breach in the contract," explained Beaumont, "but Iet's keep the door open, let's not take sides in this thing. Let's keep talking because we've got a fair way to go yet." Talking is one thing Beaumont appears to be a master of having carved out a career as an administrator that is as notable as his playing days. "I would like to think I can use the contacts I have got and the relationships I have built up among our neighbours," he said. That's what the Union wants to do. We are obviously keen to resolve this situation without a doubt. We don't want to be at loggerheads with our neighbours all the time or our clubs all the time - why would we?" And will there be an amicable resolution? "I'm sure there will be fair bit more repositioning over the next month or two but I like to think that six countries will still be involved in the European Cup."